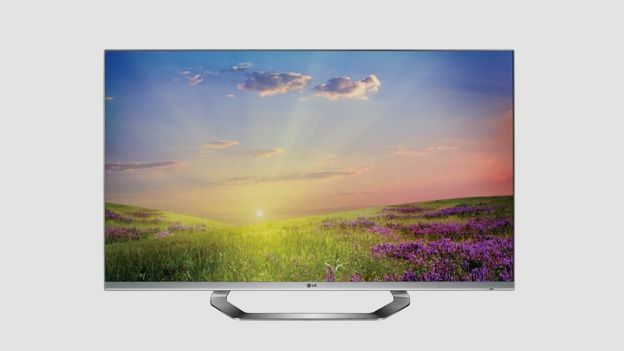 There's no doubt that the LG 47LGLM670T is one fine-looking TV. Also available in 55- and 42-inch screen sizes, it's part of an army of tarty thinscreens that peak with the brand's LM960V supermodel. The spec here is much more modest. Expect to find it in a shootout with the Panasonic TX-L47ET5 and the Samsung UE46D7000. While the panel is more functional than flashy, this set still has all the toys. Along with Passive Cinema 3D, it offers access to the brand's online Smart TV portal via a much improved home dashboard. Key net TV streaming services, including BBC iPlayer, YouTube, Lovefilm and more, are all in attendance. USB and LAN file support is appropriately generous, with MKV, AVI, MP3 and AACs all playing. Minimised bezel, maximised 3D: that's the marketing spiel and we're not going to argue. Perch the screen on LG's Metal Ribbon stand, and the result is downright drool-worthy. The set ships with two controllers, a regular zapper and LG's waggletastic Magic Remote. The rear jack pack is sensibly equipped. There are four HDMIs, all side facing, plus component and Scart via adaptors, PC, three USBs, Ethernet, CI Slot, plus a digital optical audio out. If you don't have Ethernet to hand, no problem; there's built in Wi-Fi too. Those looking for a peerless picture should explore further up the LG range. There are too many panel compromises evident here to satisfy video enthusiasts. Contrast is good, only because blacks have been crushed like bugs. It's impossible to get shadow detail from images without washing blacks out into mid-gray. Motion clarity is also poor. That said, for causal viewers this 47-incher still offers eye-candy pop, thanks a vivid colour palette. The TV's Cinema 3D performance is generally acceptable, if you ignore the crosstalk. Five pairs of polarising specs are included in the box. On a screen this size, passive's lack of resolution is evidenced by clear jaggies and line structure; but depth, colour and brightness are all excellent. Take care with your viewing position though, if you move too far off the vertical axis the image completely unravels. Sonically, the set is surprisingly inoffensive. Given the constraints of the slender cabinet, LG's engineers have done a solid job. Of course, we still advise you add a supplementary sound system at some point. LG's affiliation with London Fashion Week has apparently paid off – the LG LM760ST is drop dead gorgeous. From the metallic edging to the curvaceous stand, it's a statement piece with a feature specification to match. From the reworked UI to network niceties, this screen doesn't miss a trick. Consider our appetite well and truly whetted for its high performance cousins.